Going down to the beach over Labor Day weekend always sounds like a good idea, doesn't it? A nice three day weekend when the weather is still warm to say farewell to the summer season while sun baiting on the beach and enjoying all of summer's vacation festivities one last time...ah. I love a nice beach weekend! That's what I had in mind for this weekend down at Ocean City New Jersey with my parents: a little sun, a little relaxing, and cooking up some good eats for dinner at night! Spicy shrimp are paired with a fresh and cooling peach salsa to make a yummy dinner that is the perfect meal to whip up at the end of this summer season while (hurricane permitting) the weather is still nice enough to grill and peaches and tomatoes are over abundant! And of course the best part...this meal is SUPER healthy while still being SUPER flavorful! One serving has only 264 calories and is high protein and low carb. Here's how to make it! Spiced shrimp skewers paired with a fresh peach salsa make the perfect flavor combo for an end of summer recipe! Combine all spices together in a small bowlAdd shrimp, olive oil, lemon juice and spices into a ziplock bag and mix together. Let marinate in the fridge for at least half an hourTo make the peach salsa, combine peaches, tomatoes, cucumber, garlic, cilantro, and lime juice. 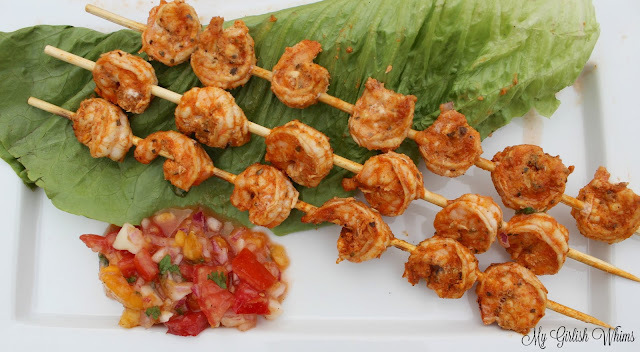 Season with salt and pepper and leave in fridge until shrimp are cookedAfter shrimp are finished marinating thread onto skewers and grill for two minutes on each sideServe skewers over lettuce with side of peach salsa! Overall about 6oz of shrimp with about 3/4 cup peach salsa is 264 calories 15 grams of carbs, 6 grams of fat and 37 grams of protein. Oh my gosh, do these look good? 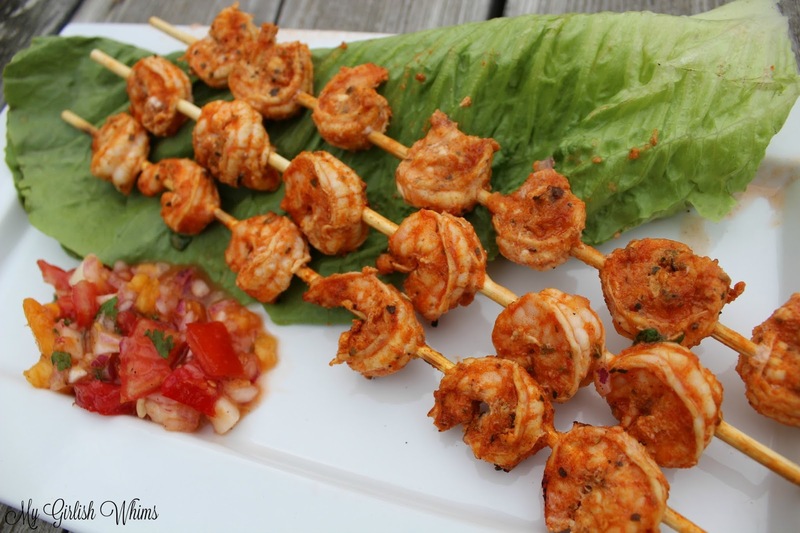 I love love love shrimp and I can't wait to try this recipe. Love your blog too! Nice Recipe.. I love to eat shrimp..